The first page has the new 2s-8s and deletions; the rest contains all the new words in alphabetical order, the number of new words by length, and the words added to OTCWL2018 but not added to OSPD6. This page was created to help with the transition from OWL3/OSPD5 to OWL4/OSPD6. OSPD6 was released by Merriam-Webster on 24 September 2018. We are still waiting to hear from NASPA when OWL4 (OTCWL2019?) will be available, but it won't be until Spring 2019 at the earliest. On 13 December 2018, NASPA sent out an email announcing the draft list of New Words for OWL4, with an effective date for club and tournament play of February 1, 2019. On 4 January 2019, NASPA sent out an email announcing the postponement of the effective date of the new words until March 1, 2019. NASPA members can login to the NASPA website and download the wordlist as it currently stands. This same email stated: "these files are close to final, but there may still be some changes" and "There will be a small number of deletions that represent corrections from the previous edition - fewer than 20 entries in all likelihood". They also say "A new release of NASPA Zyzzyva that includes OTCWL2018 is targeted for January", but I would not count on that. This is page is a work in progress. Please email any comments, corrections, or suggestions to Rebecca. The Official Tournament and Club Word List, aka OTCWL or OWL, contains the list of 2-15 letter words acceptable in club and tournament Scrabble. The OWL is sanctioned by North American SCRABBLE Players Association, and is available to NASPA members only. 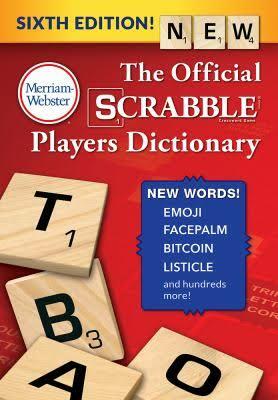 The Official SCRABBLE Players Dictionary, or OSPD, contains the list of 2-8 letter words (with limited definitions) and is used for School Scrabble, and home or casual play. The OSPD can be purchased by anyone. You should be able look up OSPD6 words at the Merriam-Webster Scrabble Word Finder website (click Tournament Mode and use your NASPA login to access the full list). There is an option to choose between "Tournament Mode" and "OSPD6", but be warned that "OSPD6" option doesn't show LOTS of very common words, so don't use it. Warning: after a few minutes of using the website, it will arbitrarily log you out of Tournament Mode so your results will change. Just be sure you are still in Tournament Mode when you are using the tool. Where can I get a printable copy of the new words? As of January 2019, for the full list of changes, you can login to the NASPA website and download the list and print it for yourself (after logging in to the Member Services page, scroll down until you find the list of OTCWL2018 documents). Do you have a list of the "new words"? Not yet. Merriam-Webster published OSPD6 on 24 September 2018, but did not issue a list of the new words - they just gave a few dozen and said "more than 300 were added". Folks have been combing through the print OSPD6 and also looking at M-W online to glean the list. You can see what has been found so far in the New Words OSDP6 section on this page. NASPA has not released any specifics on new words for OWL, but in a 27 September 2018 email from NASPA, John Chew is quoted: "When the next OTCWL is ready, the list of its new words will be a free download for NASPA members." On 13 December 2018, NASPA released a draft list of the new OWL4 words, that you can download from the member services section of the NASPA website (login and then scroll down to "OTCWL2018xxxx"). You can see excerpts of the additions below. Will all the new OSPD6 words be added to OWL? We don't know yet. Ideally, OWL4 will include the updates to OSPD6, but there were tons of discrepancies between OSPD5 and OWL3, so we have no guarantees. In a 27 September 2018 email from NASPA, John Chew is quoted "In principle, all of the new OSPD6 words should make it into the next edition of the OTCWL, after being vetted again by the Dictionary Committee." When will OWL4 come out? When will the new words go into effect? According to a 9/24/2018 NYT article, John Chew said that the OWL "won't be updated with the new Merriam-Webster additions until early next year" (i.e., 2019). NASPA has given no other dates or specifics. If they want the new words to be in use for National's next year, they'll have to release the OWL and a working version in Zyzzyva! no later than April 2019. If they can't make that date, then they'll probably wait until after National's - or release it at National's for an effective date late in 2019, or even into 2020. Remember, OWL3 was released in August 2014 and was supposed to go into effect December of that year, but the effective date was delayed an additional 5 months(! ), to April of 2015. The words listed below are found in the Merriam-Webster Scrabble Word Finder website, which was recently updated to OSPD6. Most of them have also been verified in print versions of OSPD6. Thanks to the hard work of all the folks who have contributed to this effort! so the number of words that are new to us = 289. This list is very much a work in progress. Please send corrections or additions to: to Rebecca. BALDIES added to OWL3, but not in OSPD5. Also BALDY and BALDIES were good in OWL2 & OSPD4, but were removed from OSPD5. They are all back now. BALDY added to OWL3, but not in OSPD5. Also BALDY and BALDIES were good in OWL2 & OSPD4, but were removed from OSPD5. They are all back now. BLEWITSES incorrectly added to OSPD5. not found online for OSPD6, so hopefully gone for good. OVERTHINNED v. to make too thin, OVERTHINNED, OVERTHINNING, OVERTHINS OVERTHIN was already good adj. TRUTHER n. one who believes the truth is hidden ?! UMBELLULE n. in OWL3 but not in OSPD5. NOTE; UMBELULE(S) was in OSPD5, but no longer online, so this looks like a correction and they have deleted UMBELULE(s). OWL3 had both versions. Looks like OWL4 should follow OSPD6 on this. 26 February 2019: For the full list of changes, you can login to the NASPA website and download the list and print it for yourself (after logging in to the Member Services page, scroll down until you find the list of OTCWL2018 documents). NASPA's document is 16 pages long, so we've made a more compact version (just 10 pages) with all the changes that you need: OTCWL2018 Update.pdf Our document also lists the deletions, the number of new words by length, and the words added to OTCWL2018 but not added to OSPD6. Updated 18 December 2018, using the new OWL4 word list downloaded from the NASPA website. NASPA's email of 13 December 2018 notes: "Note that these files are close to final, but there may still be some changes" and "There will be a small number of deletions that represent corrections from the previous edition - fewer than 20 entries in all likelihood." These lists are very much a work in progress. (Note: I've only done words 2-9 in length so far; will add the 10s and higher soon). Please send corrections or additions to: to Rebecca. BLEWITSES incorrectly added to OSPD5. not found online for OSPD6, but it IS in print OSPD6. and now they added it to OWL4, perpetuating the error. THIS SHOULD BE REMOVED! So far, these are words that were added to OWL3 but not to OSPD5 and now are being removed from OWL4 (and they are still not in OSPD6). Added list of proposed deletions from OWL4 (words that were in OWL3, but will be removed). Using OWL4 list from NASPA website, added list of new OWL4 words (separated into groups by whether the words are in either or both OWL4 and OSPD6). Started with 2-9s and will add longer words soon. Added list of 311 words that are new to OSPD6. Note: 45 of these were already in OWL3, but omitted from OSPD5. Still working to add more words (as they are found), and to correct what we have found already. Thanks! Created this page. See the transition to OWL3 page for more history on updates to the OWL/OSPD.